The Rosanne Morey Christ Child Project will receive offerings gathered in Church throughout the months of November and December. These projects uphold the beliefs of St. Luke’s that it is important to support those around us, in all aspects of life, in an uplifting and respectful way. 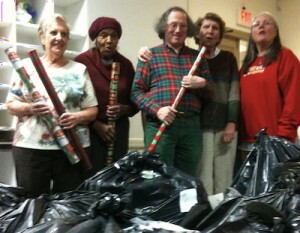 During the holidays, St. Luke’s participates in many initiatives to help do just that! We hope that you consider participating as well to help make Christmas more joyful for our community and those around us. The Youth Consultation Service Therapeutic Nursery in East Orange, NJ provides highly structured support to children with special needs between the ages of 2 1/2 and 5. St. Luke’s sponsors approximately 10 families of YCS children. We receive a list of specific items the family would like for the holidays and make the necessary purchases. If you would like to fulfill these holiday wishes, please contact Lilli Delmar at ldelmar@ycs.org. Feel free to partner with a fellow parishioner to sponsor a family jointly. Lilli will provide you with the ages and gender of each family member and their needs/wishes for the holidays. Apostle’s House in Newark provides transitional housing to adult men. The St. Luke’s Choir has supported these men with gifts of toiletries, socks and sweatshirts for many years. Gift requests for the men will be on the Giving Tree at Coffee hour. For more information, please contact Stephanie Borsi at stephborsi@aol.com. The Diocese of Newark Prison Ministry is a way to make the holidays brighter for children whose parents are incarcerated. Gifts for toddlers through high schoolers are always appreciated. Some interesting ideas are art supplies, sports equipment, music, clothing, and winter wear like hats and gloves. To donate or for more information, contact Susan Singer ssinger726@gmail.com or Jill Eden at e.jilleden@gmail.com. Cash donations can be made by noting “Rosanne Morey Christ Child Project” on the red and white envelopes in church in the pews or by selecting an envelope from The Giving Tree at coffee hour. Online Gifts can also be made via the Log In tab on our website front page at the top right corner. Cash donations will be used to fill in any gift requests which remain open after all gifts have been received. If you have any questions about donating money to the Rosanne Morey Christ Child Project, please contact Catherine Murray. ← Women’s Group Night Out – December 13 – 7:00 p.m.